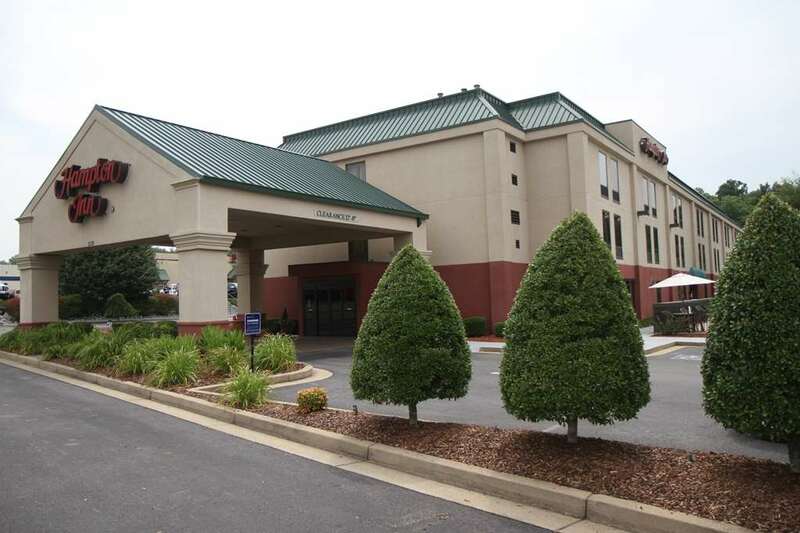 The Hampton Inn Greeneville hotel is located off Hwy. 11E on the east side of Greeneville Tennessee. Our hotel is within minutes from downtown Greeneville Tusculum College Mt. Pleasant Business Park and retail shopping centers. We are a 40-mile drive from the Bristol Tennessee Motor Speedway. Greeneville area attractions include museums historic sites a state park natural scenic trail golf courses and Hands On Regional Museum. Within a half mile guests of our Hampton Inn hotel can dine at Stan*s Barbecue Applebee*s Butcher*s Block or Ryan*s. The Hampton Inn Greeneville features 67 rooms some with whirlpool*s and kitchenettes hotel meeting space to accommodate up to 12 people golf packages an exercise gym and an outdoor pool. We offer complimentary high-speed wireless internet access available throughout our hotel and a deluxe complimentary continental breakfast served daily. Each room of our Hampton Inn hotel features a hair dryer coffeemaker desk phone with a data port and voicemail and cable TV with HBO and pay-per-view services. We also offer safety deposit boxes valet laundry audio visual equipment connecting rooms cribs irons and ironing boards. Laundry/valet services a guest laundromat meeting/banquet facilities and rollaway beds are available for a nominal fee. We love having you here in Tennessee at the Hampton Inn Greeneville. Butcher Block: Steaks - Seafood. Does not serve alcohol - *brown-bagging* is permitted.